The NCAA has discovered Iowa’s Megan Gustafson. Friday morning the official NCAA women’s basketball account published a tweet declaring the senior a rising star. Gustafson has been nothing short of dominant for Lisa Bluder’s Hawkeyes the last two seasons. She’s been named the Big Ten conference’s Player of the Week a record 21 times. At this point it’s more newsworthy when the Port Wing, Wisconsin, native doesn’t receive a weekly honor from the league. How can anyone – let alone an official NCAA account – make such an egregious mistake? Simple. Megan Gustafson plays at Iowa, not UConn or Notre Dame. Because if she did at either of those places what she’s done in Iowa City, she’d be a consensus first-team all-American. Gustafson will leave Iowa as the school’s all-time leading scorer and rebounder in the sport of basketball. That includes the women’s program and men’s hoops. Speaking of the men’s game, if Mark, Mike or Matt Gustafson put up Megan Gustafson numbers, they’d be a mainstay on SportsCenter, agents would be circling Carver-Hawkeye Arena and six-figure endorsements would be pending for all sorts of brands with products to pitch to hoops junkies. 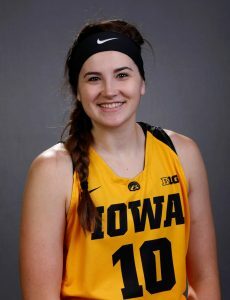 But Megan Gustafson is Iowa’s Megan Gustafson, so she’ll take the court Sunday when the Hawkeyes host the Maryland Terrapins and toil away in relative anonymity, once again putting her team on her back in an effort to carry it to the school’s first regular season Big Ten title since 2008. There’s a bit of a buzz surrounding this weekend’s game. Brenda Frese’s 12-2 Terps hold a one-game lead over the Hawks in the conference standings. Both squads reside inside the Top 15 in the latest Associated Press and Coaches polls. It’s bad enough that women’s basketball has to fight for the little amount of attention it does get from national and local media outlets (and, yes, that includes this one) but when the sports own governing body appears to fail at recognizing one of its best players, well, that has to bring another level of frustration to Bluder and her staff. I don’t know much about the women’s game but I can tell you one thing – there may be a rising star on the floor of Carver-Hawkeye Arena Sunday but it sure as heck won’t be Megan Gustafson.